After all my pre-Thanksgiving posts with new recipes for the holiday table, I actually ended up with a slightly revised menu than I had planned. 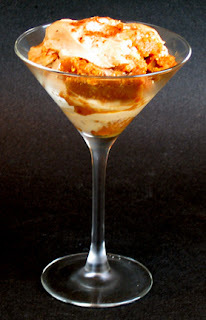 Since I had just made all those new dishes last week, when it came time to actually cook for Thursday's big meal, it went something like this: When I told Jon I planned to make the pumpkin tiramisu, he said, "You just made that last week. 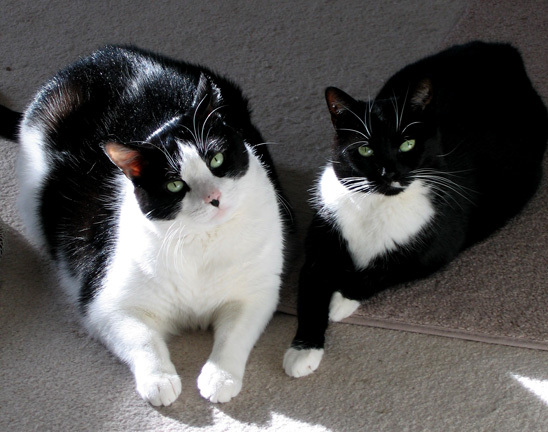 Can we have an apple pie instead?" So I made an apple pie which turned out to b the BEST apple pie I've ever had in my life. The secret? Stayman apples! I never used Staymans before and now I will never use anything else for pies. Wow, what a flavor. When I mentioned I was making the new green bean recipe, Jon said, "That was good, but you're going to make the casserole with those fried onion rings, right?" For my own part, I opted against the "en croute" part of the seitan roast, feeling that we'd have enough carbs without a pasty crust on the main dish. Instead I glazed the roast with a cranberry-port glaze. I made the loaded mashed potato casserole, the chestnut-porcini gravy, and roasted sweet potatoes with pecans and cranberries. I used mango jam to make my cranberry sauce because I still didn't replenish my supply of lime marmalade. So there you have it. Some old dishes, some new. All delicious. What did you have for Thanksgiving dinner? On this day, as we reflect on what we are thankful for, I wanted to share this lovely piece that was posted on the Huffington Post and written by Ken White. It's called Thankful for the Animals. We’re in the home stretch of my Thanksgiving recipes from this year’s menu. All that’s left is the gravy! I have a few favorite go-to recipes for sauces and gravies. One is the Madiera Sauce posted on my Vegan Thanksgiving Feast on Vegan.com. 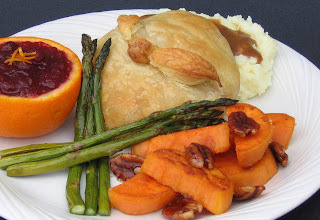 The other is a brown gravy posted on another Vegan.com Thanksgiving feature. This year I decided to make a chestnut-porcini gravy. Instead of making a homemade stock, I used a porcini bouillon cube for a rich broth. I found them at an Italian market this fall when I was in Providence, and they have such a great flavor. The chestnuts I always get at an Asian market because they sell cooked chestnuts in vacuum-sealed bags for under $2 a bag. Heat the oil in a saucepan over medium heat. Add the onion and cook until soft. Stir in the mushrooms and cook until slightly softened, then stir in the thyme, sage, and port, if using. Add the chestnuts and 1 cup of the broth and bring to a boil. Reduce heat to a simmer and cook for 5 minutes. Transfer the mixture to a high-speed blender or food processor, add the remaining broth and process until very smooth. 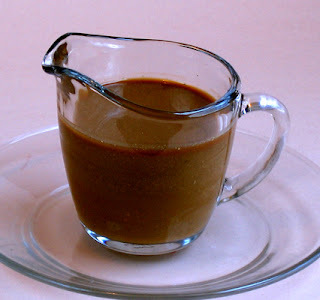 Transfer the gravy back to the saucepan and season with salt and pepper to taste. Simmer until the gravy is hot and the flavors are blended. If the gravy is too thick, stir in additional broth or some almond milk. If it isn’t thick enough, stir in a little cornstarch slurry over medium heat, stirring until thickened. Sorry I was so late getting this posted today. It was too dark to take the photo last night, and then the batteries went dead this morning. Better late than never. Happy Thanksgiving! When I was growing up I thought I didn't like cranberry sauce. I realize now that was because my mother, who otherwise was a terrific "fresh from scratch" cook, used to serve that awful jelled mass from a can that was cut into slices (!) to serve. How anyone could think that stuff tastes like cranberries is beyond me. Needless to say, once I tastes fresh cranberry sauce, I never looked back. And it's so simple to make, too. On the back of a bag of cranberries is the basic recipe: Just combine 1 (12-ounce) bag fresh cranberries, 1 cup sugar, and 1 cup water in a saucepan; bring to a boil; then simmer until the berries pop, stirring to dissolve the sugar. 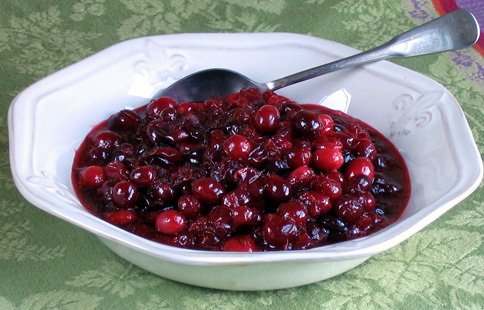 It takes about 5 minutes and makes a good basic cranberry sauce. There are, of course, many ways to improve upon the basic recipe, such as using fruit juice to replace the water (orange juice or cranberry juice are good choices). Sometimes, I've added bits of orange; another time, ginger; another time, chopped apples and pecans. This year I decided to skip the water and sugar entirely in favor of one of my latest food addictions: lime marmalade. A good friend introduced me to the pleasures of a PB and J made with lime marmalade and it was the best PB and J I ever had. I have since used lime marmalade in other recipes, such as a dipping sauce for spring rolls and in a glaze for tofu. I've gone through jars of the stuff. Trouble is, I can't find it locally and have to order it online. But it's worth it. For the cranberry sauce, I had planned to combine the fresh cranberries with a cup of the lime marmalade, but discovered that I was on my last jar with only 1/2 cup remaining. So I made up the difference with 1/2 cup of mango jam, and I'm convinced its even better than if it had been entirely made with the lime marmalade. I braised the cranberries with the marmalade and jam for about 5 minutes, stirring as the jam and marmalade melted and the cranberries popped, releasing their own liquid. At this point you should taste it. If it's not sweet enough to your taste, you can then add some sugar* or more jam. (We happen to like a tart cranberry sauce.) Then transfer to a container and cool. The cranberry sauce will firm up a bit after chilling in the refrigerator, but it will still give off some intensely delicious juice. TIP: Strain off this juice and use it as a base for a sauce: it's great in a barbecue sauce or use it as a base for an Asian-style dipping sauce or teriyaki sauce. I've even added a little to brown gravy. If you don't have lime marmalade, consider using orange marmalade. And I do love the half and half of citrus with mango, although you could try peach, apple, or pineapple jam instead. As you can see in the photo, I garnished it with a little finely grated lime zest to bring out the fresh lime flavor. 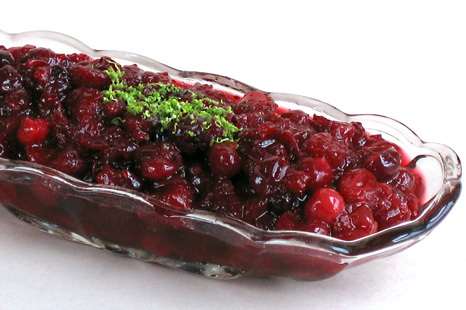 If you think you don't like cranberry sauce, you might want to give this a try! *I added about 1/4 cup of light brown sugar and it was still nicely tart. We'll be enjoying our traditional seitan roast on Thanksgiving, but it's the vegetables that are the real stars in our house. I love the way the vibrantly colored sweet potatoes, cranberries, squash, and green beans look like an autumn landscape on my holiday table. Truth is, I'm happiest when I can make a meal out of what are commonly referred to as "side" dishes. 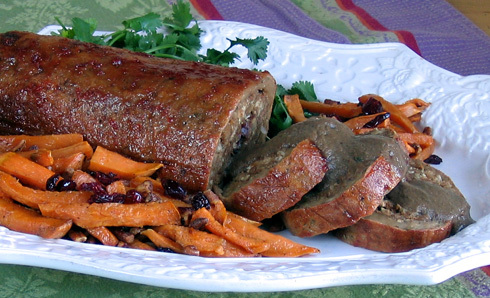 There are lots of vegan roasts you can buy that are already prepared, such as the ones from Field Roast and Tofurky. Another idea is to make a large stuffed squash (or several small individual stuffed squashes) that can be filled with grain or bread stuffing, depending on what you like. Stuffed squash is a great choice because it's colorful and delicious but can also be made gluten-free and soy-free. For something different, consider making a Moroccan bisteeya (a pastry covered savory pie), a lentil shepherd's pie (maybe topped with half mashed white potatoes and half mashed sweet potatoes), or even a nice pan of lasagna. For an easy no-fuss one-dish meal, you could make my Roasted Sweet Potatoes with Crispy Kale Ribbons -- with or without the addition of the walnuts and dried cranberries -- and to it, add some sauteed sliced sausage links (homemade or storebought such as Tofurky brand) for extra protein, or instead of sausage, add some cooked cannelini beans. 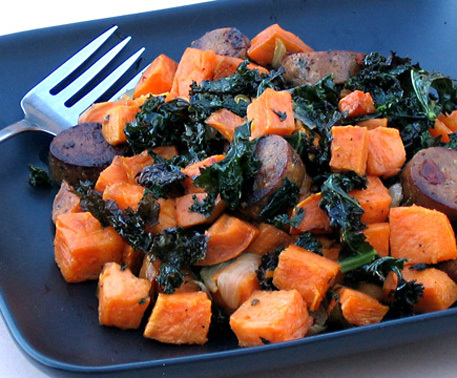 You could also substitute diced butternut squash for the sweet potatoes, if you prefer. The colors and textures are wonderful together and if you season it with a little ground sage and thyme, it will taste like Thanksgiving. I especially like the crispy kale ribbons in this -- it's a fun way to employ the popular kale chip concept as part of the meal. And if you've never had roasted sweet potatoes before, you're in for a treat. The countdown to Thanksgiving is getting down to the wire. 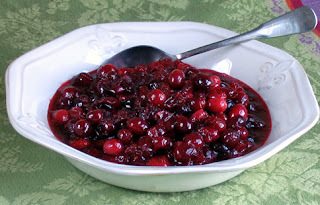 Still to come on my blog: a new take on cranberry sauce, an easy and delicious gravy, and another main dish idea. 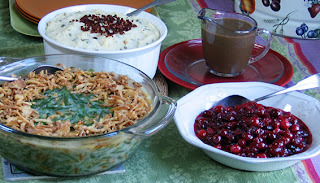 And for more ideas, check out my entire Thanksgiving menu (with recipes) on Vegan.com as well as the Thanksgiving and Christmas menus (and recipes) in my book, Party Vegan. 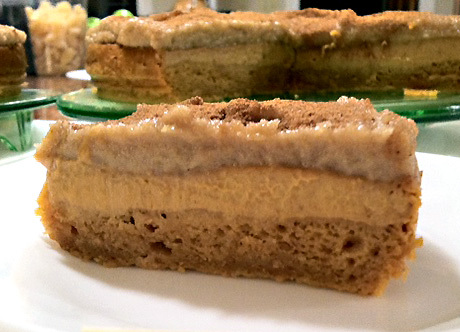 After more than 20 years of making pumpkin cheesecake for Thanksgiving, I’ve decided to break with tradition this year and create a new recipe: Pumpkin Tiramisu! Since tiramisu is one of Jon’s favorite desserts, I thought it would be great to make a pumpkin-y version for the holiday. But I also wanted to make something that could be prepared in one pan — not just assembled later — an important factor on Thanksgiving when things can get hectic in the kitchen. It was also important to me that this could be made both soy-free and gluten-free if necessary, for people who might be at the table with such food sensitivities. I’m happy to report that, after four tries, the recipe is a resounding success on all counts. It’s made up of three layers: a bottom pumpkin cake layer, a middle layer of creamy pumpkin filling, and it all topped with a final layer of maple-rum cashew cream. The recipe can be made in either and 8 or 9-inch springform pan or a 7x10-inch or 8-inch square baking pan. It can be sliced and served on a plate so you can see the three layers, or spooned into pretty dessert glasses, as shown in the top photo (please excuse the flash photo). If you want to go all fancy-pants, you can, instead, bake each of the first two layers in separate pans, and then assemble all three layers in individual dessert glasses, allowing for the layers to show distinctly in the glasses. Normally I might opt for that presentation, but I think that most of us on Thanksgiving just want something we can make and serve with as little fuss as possible. .....Well, I guess that about sums it up. Hope you enjoy! Preheat the oven to 350 degrees F. In a bowl, combine the flour, sugar, pumpkin pie spice, baking powder and salt, and mix well. Add the wet ingredients to the dry ingredients, and stir to combine. 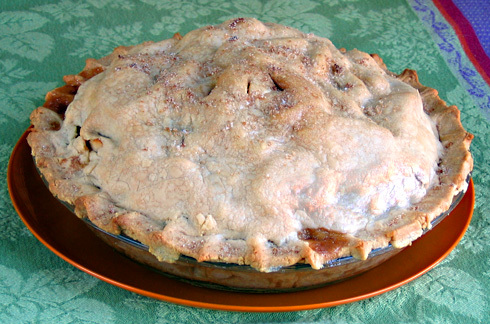 Scrape the batter into a lightly oiled 7x10 or 8x8 baking dish or an 8 or 9-inch springform pan. Bake for 20 minutes. While the cake is baking, combine the cream cheese (or cashews + cannelini beans), pumpkin, sugar, cornstarch, rum, and the pumpkin pie spice in a food processor or high speed blender, and blend until smooth and creamy. Spread the mixture onto the cake and return to the oven for 20 minutes, or until set. Remove from the oven and set aside to cool, then refrigerate until chilled. In a food processor or high speed blender, combine the cashews, maple syrup, sugar, rum, and vanilla, and process until completely smooth and creamy. Scrape into a bowl and refrigerate until needed. 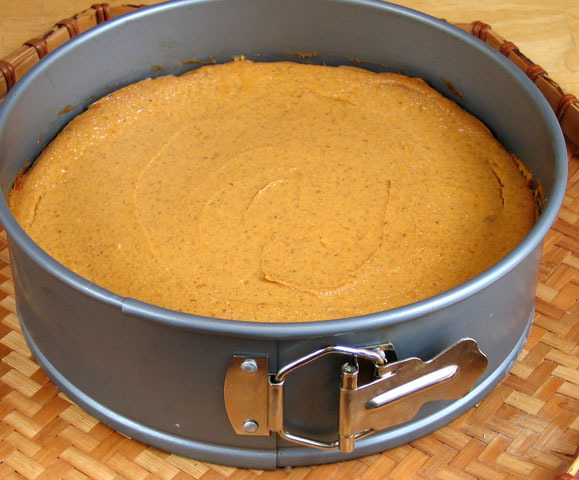 Spread the maple-rum cream onto the chilled pumpkin cream layer. Sprinkle the top with a light dusting of pumpkin pie spice. Refrigerate for at least 1 hour before serving. Instead of vegan (soy) cream cheese: you can use the option provided in the recipe for cashews + cannellini beans. 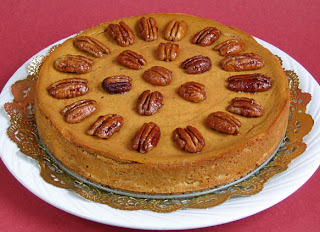 Note: if making my pumpkin cheesecake recipe, you can use this formula to replace the cream cheese in the recipe: 1 cup vegan cream cheese = 3/4 cup raw cashews, soaked 4 hours or overnight and drained (110g) and 1/4 cup cooked cannelini beans, rinsed and drained (65 g), pureed in a high speed blender. For a gluten-free version: use your favorite gluten-free flour blend. For an alcohol-free version: use apple juice in place of the rum. So far this week, we covered the Deconstructed Green Bean Casserole, the Roasted Sweet Potatoes with Crispy Kale Ribbons (on OneGreenPlanet), and the Stuffed Seitan en Croute (on Vegan.com). And we've also discussed pumpkin cheesecake at length, although I've been inspired to make something new this year: pumpkin tiramisu (recipe coming soon).) Now on to the potatoes! 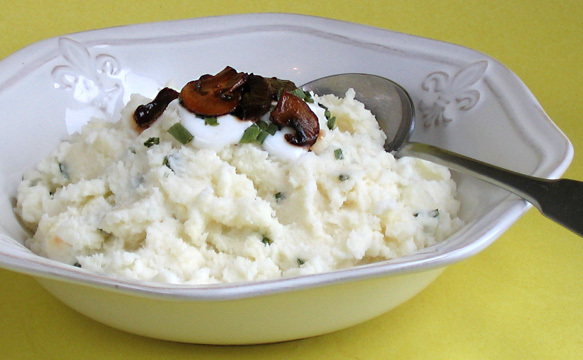 For years I was conflicted about when to prepare the mashed potatoes for Thanksgiving. There's always so much going on, but I always thought they had to be made at the last minute and I have a thing about leaving dirty pots and pans around when I'm serving a special meal. That's why I'm glad I discovered that mashed potatoes will stay perfectly fluffy and wonderful when kept warm for a few hours in a slow cooker (on the Keep Warm setting). That way you can make them and wash up the pot while they keep warm and ready to serve. Mashed potatoes are extremely versatile and can be embellished in a number of ways, by adding garlic or fresh herbs, or even wasabi or chipotle. There's also the colcannon-type addition of cooked greens such as kale or chard. For Thanksgiving, I usually go for garlic mashers, but this year I'm trying something a little different. It's a spin on "loaded" baked potatoes -- but with mashed potatoes. I took the recipe for a test drive last weekend and it's delicious. You can use your favorite vegan bacon, whether storebought or homemade (I've included a recipe for one made with cremini mushrooms), or omit the bacon altogether. I've also provided a "make ahead" option for the oven, although oven space can be a challenge on Thanksgiving, so you might want to consider keeping them warm in the slow cooker -- or you could just do it the old fashioned way and make them at the last minute. After all, what's one more dirty pot? Cook the potatoes in enough boiling salted water to cover until tender when pierced with a fork. Drain well and return to the pot. Add the Earth Balance and the sour cream and mash the potatoes. Add half of the chives, and as much of the warm milk as needed for the desired consistency. Season with salt and pepper to taste. To serve immediately: transfer to a serving bowl and top with an extra dollop of sour cream, the vegan bacon and remaining chives. If not serving right away: transfer the potatoes to a greased Slow Cooker set on Warm where the potatoes will keep well for a few hours. When ready to serve, transfer to a serving bowl and top with an extra dollop of sour cream, the vegan bacon and remaining chives. To make ahead and bake: Transfer the potato mixture to a greased baking dish, spreading evenly. Cover and refrigerate until needed. When ready to bake, bring the casserole to room temperature. Preheat the oven to 375 degrees F. If using breadcrumbs, mix them in a small bowl with the vegan bacon. Cover with foil and bake for 30 minutes, then remove from the oven, remove the foil, sprinkle on the bacon (and bread crumbs if using) and return to the oven for 15 minutes or until hot and golden brown on top. If desired, serve with a small bowl of sour cream and chives on the side. You can leave the mushrooms in slices or chop them to look like bacon bits. They can be cooked on the stovetop or baked in the oven. In a bowl, combine the soy sauce, maple syrup, ketchup, mustard, and liquid smoke. Stir to mix well. Add the mushrooms and toss to coat. Stovetop: Transfer the mushrooms to a lightly oiled skillet over medium-high heat. Cook, stirring, until cooked and nicely browned. Oven: Preheat the oven to 350 degrees F. Spread the mushroom slices in a single layer in an oiled baking dish and bake until nicely browned, turning once, 20 to 30 minutes. Just a reminder that tonight is the VegNews Thanksgiving Twitter chat. Here's the link to find out all the details. The traditional green bean casserole found on many dinner tables on Thanksgiving takes a lot of ridicule. And it's no wonder, considering that the original recipe calls for canned mushroom soup, canned green beans (although there is a frozen green bean version), and canned fried onions. The resulting casserole, although it has a certain retro comfort food appeal, is not the healthiest, nor is it the tastiest, if what you want to taste are green beans as opposed to sodium. I've created many healthier versions of the casserole, using fresh green beans and healthier sauces -- one recipe even uses pureed white beans in the sauce. But it still remained a casserole, and the green beans, while tasting much better, still didn't shine as much as they deserved. That's why this year, I'm deconstructing the venerable casserole. I know a lot of people roll their eyes at the whole "deconstruction" thing, but it's a perfect way to describe this dish. Essentially, I've taken the elements of the casserole: the green beans, mushrooms, sauce, and onion rings (in this case, shallot rings) and let each element stand on its own, allowing you to combine at will. For my own part, I've enjoyed sampling each flavor on its own, as well as taking various bites that included a little of all or most of the elements. 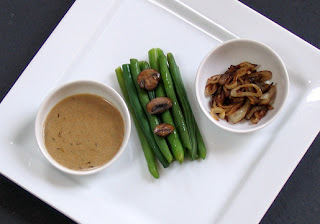 I've provided two ways to cook the green beans initially -- the more traditional steamed method which brings out the wonderful natural flavor of the beans (just be sure to watch them carefully as they can go from too firm to too soft in a matter of seconds.) I've also included the option of roasting the green beans before adding to the "casserole" -- roasting give the beans a totally different character, both in terms of flavor and texture. Note: Instructions are provided for either roasting or steaming the green beans. 1. To steam the green beans: Place the green beans in a steamer pan over boiling water. Reduce the heat to a simmer and cook until the green beans are just tender. Remove from the steamer and set aside. 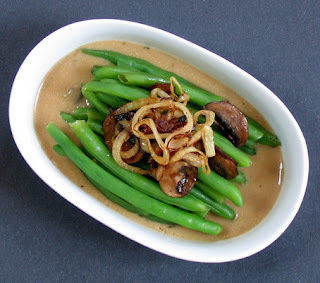 To roast the green beans: Spread the green beans in a single layer on an oiled rimmed baking sheet. Drizzle with a little olive oil and roast until tender, about 30 minutes, turning once about halfway through. Set aside. 2. Arrange the shallots on an oiled baking pan and roast until golden brown, about 20 minutes, turning once about halfway through. 3. Heat the oil in a large skillet over medium-high heat. Add the mushrooms and saute until softened and slighted browned. Remove the mushrooms from the skillet and set aside. In the same skillet, over medium heat, add the onion, cover, and cook until softened, about 5 minutes. Add the garlic, marjoram, and thyme. Stir in about half of the reserved mushrooms and sprinkle with the flour. Stir in the broth, stirring to thicken. Stir in the nondairy milk and simmer, stirring, until thick, about 5 minutes. Season to taste with salt and pepper and transfer to a casserole dish. 4. 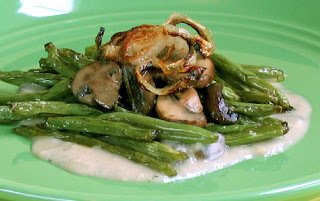 Arrange the reserved mushrooms on top of the sauce, then arrange the green beans on top of the mushrooms, with the roasted shallot rings on top. Serve hot. If making ahead, the casserole can be refrigerated and then covered and reheated in the microwave or the oven until hot. There's lots more coming up in the next week to help you make a delicious and cruelty-free Thanksgiving meal that everyone will enjoy. For another amazing side dish, check out my recipe on OneGreenPlanet for Roasted Sweet Potatoes and Crispy Kale Ribbons, complete with a holiday variation. (Please "Like" this recipe on OneGreenPlanet, and share it with your friends on Facebook and Twitter. SPECIAL ANNOUNCEMENT: I will be participating in the VegNews Twitter Chat tomorrow night at 6pm PT/9pm ET. Join Julie Hasson (@everydaydish), Annie Shannon (@AJShannon), and me (@GlobalVegan). Let's chat turkey (free)! I’ve come up with a few new recipes for Thanksgiving this year, that I’ll post throughout the week. For today, though, the subject is cheesecake! On my “Vegan Thanksgiving Hotline” (and in my e-mail in-box) there were some questions about pumpkin cheesecake. As you know, I’m a fan of pumpkin cheesecake — I’ve been making them every year since the mid 1980s when I used to make them for restaurants. Over the years the recipe has changed somewhat. In my pre-vegan days I used dairy cream cheese, when I went vegan I began using silken tofu, and then when vegan cream cheese came out, that became the “cheese” in the cake! I only use the non-hydrogenated vegan cream cheese and I love the convenience of it. It does contain soy, so if you’re soy-intolerant, you can make a thick cashew cream cheese alternative by pureeing soaked cashews with water in a high-speed blender. 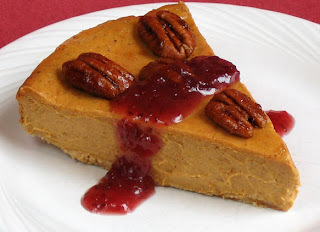 For your convenience, I’m re-posting the recipe for Pumpkin Cheesecake with Cranberry Drizzle (from 1,000 Vegan Recipes). I’ve also included several variations, including my favorite streusel-like topping, as well as my tips for making great vegan cheesecakes. Dense and rich with spiced pumpkin flavor, this dessert is a natural for your Thanksgiving table. The gorgeous orange color offset by the vivid drizzle of cranberry makes a beautiful presentation. I especially like using ground gingersnaps for the crust. From 1,000 Vegan Recipes by Robin Robertson © 2009, John Wiley and Sons. 3. Pour the filling into the prepared crust. Bake for 45 minutes. Turn off the oven and leave cheesecake in the oven for another 15 minutes. When done, edges should be golden and starting to pull away from sides of pan, and center should be soft set. Remove the cake from the oven and cool at room temperature for 1 hour. Refrigerate for at least 4 hours before serving or overnight (my preference). 4. Make the topping: In a blender or food processor, combine the cranberry sauce, maple syrup, and margarine and blend until smooth. Pour the mixture into a squeeze bottle or small pitcher and drizzle the over the top of the cheesecake. Keep refrigerated until needed. 5. To serve: Cut the cheesecake and place each slice on a dessert plate. Spoon about 1 to 2 tablespoons of the cranberry mixture over the cheesecake slice and onto the plate. Do not put too much sauce on the cheesecake or it will overpower the pumpkin flavor. * “streusel-type topping” (shown in top photo): Combine some pecans, dried cranberries, and vegan butterscotch chips in the food processor and pulse them until well chopped. Stir in a little agave, if desired, to make it easier to use. Spoon the topping on the outer rim of the cheesecake right after it comes out of the oven so it can melt into the cheesecake a bit. Add additional spices for a more deeply “spiced” flavor: a combination of ground cinnamon, ginger, nutmeg, allspice, or cloves are good. Instead of a gingersnap or graham cracker crumb crust, try crumbs made from shortbread cookies or chocolate cookies. With Thanksgiving just over two weeks away, I've been trying to decide what kind of post would be most appreciated by everyone. 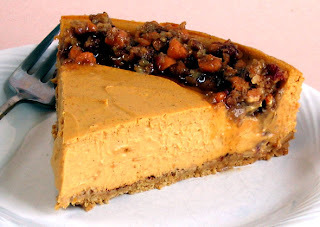 A quick check of my blog will reveal that I'm partial to pumpkin cheesecake -- especially the version I made last year with the streusel topping -- yum! 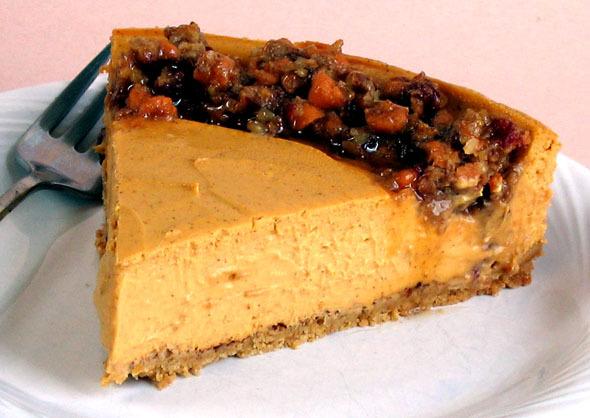 I've been making pumpkin cheesecakes every year for nearly three decades, so I have lots to say on the subject. I could give you a recipe for sweet potatoes, mashed potatoes, or cranberry sauce -- but you may already have your own favorite. Maybe you'd like some ideas for a Thanksgiving menu -- my Party Vegan cookbook contains two of them -- complete with recipes for each course. Rather than deciding on my own, I think the best ones to ask about what to post for Thanksgiving are the people who read my blog. 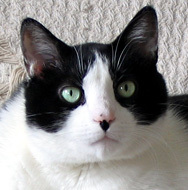 So, tell me, what would you most like to see in a pre-Thanksgiving blog post? The suggestion that turns up in the comments the most will be the topic of my next post. At the same time, I'll do my best to answer any Thanksgiving food questions you might have -- so let's call this the "Vegan Thanksgiving Hotline"! 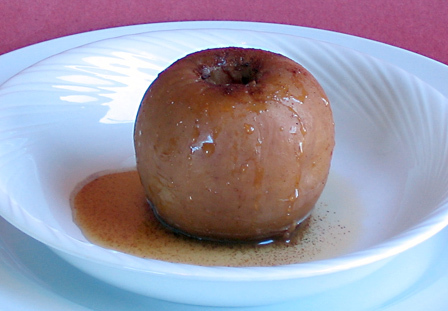 ...or, more correctly, the apple of my "not-pie" -- this is one of the luscious baked apples we've been enjoying. Northern Virginia is apple country and there are so many varieties to choose from, it's hard to decide what to bring home from the various farmstands and orchards in the area. This week we tried York and Cortland. I'm sure they'd be wonderful in an actual pie, but I chose to use them in a more virtuous way by baking several of them in my slow cooker. The flavor is as indulgent as apple pie -- without the indulgence. I'll be making them again soon. Next time, I think I'll stuff them with a little granola to make them reminiscent of apple crisp. Yum. Three's the Charm: I have lots of good news to share today, I hardly know where to begin. Let's start with the amazing honor of having one of my recipes chosen as 1 of 4 "Recipes of the Year" on Vegan.com. My Singapore-Style Rice Noodles with Tofu and Vegetables was named "Quick Recipe of the Year." This recipe happens to be a personal favorite of mine. Try it yourself and let me know what you think! Also today, I found out that my Roasted Cauliflower Picatta recipe from my post on One Green Planet was chosen to appear on the Huffington Post! A huge thank you to all who voted for this recipe on One Green Planet. Good news must come in threes, because, also today, Vegan on the Cheap got a nice shout out in the Philadelphia Daily News, along with my recipe for Tuscan White Bean Pizza appearing on philly.com. Exciting stuff! Not bad for a Thursday, huh? When Robin Asbell invited me to participate in a Virtual Potluck for her new cookbook, Big Vegan, I happily agreed. When I lived in Virginia Beach, I attended many vegan potlucks, but throwing a vegan potluck in my current vegan-scarce area would be akin to a game of solitaire. A virtual vegan potluck online reminded me a little of the old days! 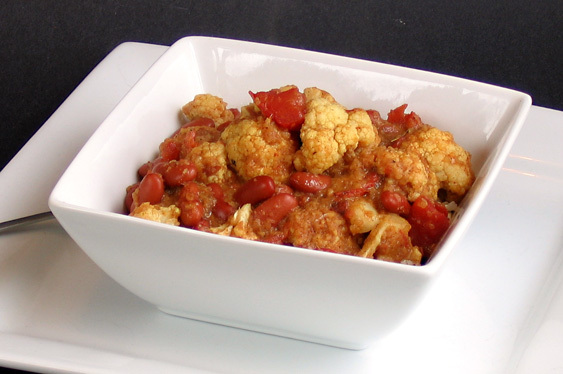 In trying to decide which main dish recipe to make from Big Vegan, several great choices caught my attention, but I gravitated to one in particular: the Bengali Curry of Cauliflower and Kidney Beans. 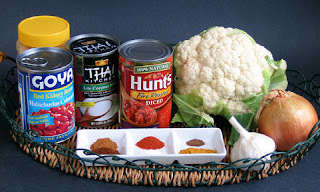 The recipe title had me at curry, but as I also adore both cauliflower and kidney beans, this dish was especially intriguing. With a sauce made from pureed onion, coconut milk, and spices, combined with canned beans and cauliflower, the recipe is a harmonious merger of flavors combined with ease of preparation. If you follow my blog, you know that I appreciate recipes that can be made using pantry ingredients and that’s another reason I was drawn to this recipe. Other than needing to buy cauliflower, I had all the other ingredients on hand. This recipe is from Big Vegan by Robin Asbell © 2011, published by Chronicle Books, reprinted with permission. 1. In a food processor or blender, finely mince the ginger and garlic, then add the onion and puree. Pour in the milk and process. Add the chili powder, cinnamon, turmeric, cloves, and cayenne and process to mix. Transfer the sauce to a large frying pan over medium-high heat. Stir the mixture until it starts to bubble, then add the cauliflower and stir to coat it with sauce. Cover the pan and cook until the cauliflower is tender, 8 to 10 minutes. 2. Add the beans, tomatoes, and salt, and cook, stirring with the lid off, until the sauce is thick and the beans are heated through. Serve hot. Thanks again to Robin Asbell for organizing this Virtual Potluck from her new book, Big Vegan.